I arrived in Tulum and was pleasantly surprised. It wasn't your usual tourist trap, beach party town. Tulum is more like a little village with one main street running from one end to the other. The main street is dotted with restaurants, bars, shops etc., but if you go off the main street then it's just a normal residential area, where people live and work. Although, compared to our neighbourhoods and what we are used to, most of us would consider these slums. They were basic one or two room houses (the size of a garage), made from concrete blocks. Inside each is a giant hammock stretched from one end of the room to the other and this is where the whole family would sleep together, eat, cook etc. Most people seem to build their own houses as well. I can only imagine what my place would be like if I had to build it myself, but I'm pretty sure you wouldn't be seeing it on "Grand Designs"! I was staying at Casa del Sol hostel, which should be renamed Casa del s***hole! There were so many things that I hated about this hostel, but mainly it was the creepy weirdo's that worked there. The staff are either permanently stoned or slightly retarded, I'm not sure which. One guy wore the same yellow trousers every day with no shirt. I was there for around 5 days and he never changed once! The beds were broken to the point where wood panels from the top bunk would fall on anyone sleeping in the bottom bunk. There were cockroaches everywhere, the bathrooms smelled, the communal kitchen was permanently dirty, and the fridge was vile and filled with months of abandoned food all congealing together. But besides the disgusting accommodation I really liked Tulum. Every day I would rent a bike and ride to the beach, which was 3-4k away. There was a great cycle path, so it was quite an enjoyable ride. I even walked it one day, which took almost 2 hours, but in the mid day heat it seemed much longer. On the walk back a truck pulled up beside me with about 10 Mexicans in the back (I think if you by a pick up truck in Mexico it comes ready stocked with at least 6-8 Mexicans in the back). The girl in the front seat asked if I wanted a lift, but I decided I did not need the Mexican police trying to explain my disappearance to my mother, so I politely refused. I am really surprised at the number of hitchhikers I've seen throughout Mexico. What is wrong with people, do they not know that is how you get killed? Stupid Gringos! 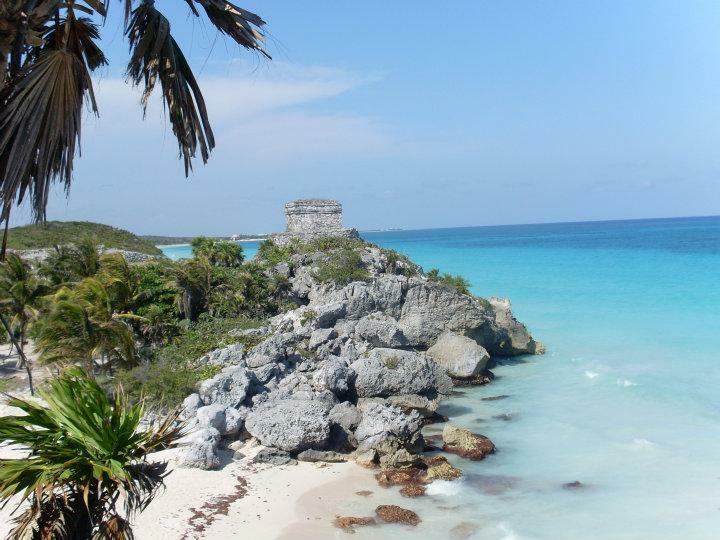 The beach at Tulum is just gorgeous! I could have happily spent everyday there and just soaked up the sun, which is basically what I did. The sand is bright white, the water is clear and you get a nice breeze from the famous crooked palm trees. Supposedly, a lot of travel companies take pictures of this beach and pass it off as somewhere else in their advertising campains because it's so perfect and picturesque. I have never seen soo many old style Volkswagen Beetles in one place in my life. Everyone has one here! It turns out that when they stopped making them everywhere else, the manufacturing continued in Mexico, which is why you can't turn around without seeing one. Here's a random uninteresting fact: Pemex is the only petrol station in the whole of Mexico because it's a state owned company controlled by the Mexican Government. Now you know! I was contemplating moving to new digs, but then I met some cool people and we decided just to stay and struggle through together. Danny from California was really nice and Daniel & Hannah from Bristol were entertaining. Bridget was an older woman from Brussels and a serious racist! She would just randomly blurt out really offensive and inappropriate remarks, which I found hilarious. I also met Miello, the local lothario from Croatia, who has been staying at the hostel for the last 3 months and has no intention of leaving anytime soon. He tried to convince me to stay in Tulum with him and enter into an open relationship, where I would have his children and he would mess about with everything and anyone. He was gross! It was here that I realised there were wild dogs everywhere in Mexico. They all look ragged and starving with crazy eyes, which was quite freaky. Whilst out cycling one day one of these dogs started running after me and kept increasing in speed until it was running right beside me. I couldn't shake it and it seemed like it was chasing me forever, but luckily after 8 blocks it finally gave up and stopped running. Thank god, because my little legs couldn't pedal any faster! I also went to the Mayan ruins site in Tulum, which was kind of boring because I didn't have a guide, so I didn't really know what I was looking at. There's that many Mayan ruins in Mexico that you lose interest really fast. The sites saving grace was the amazing beach inside the actual archaeological site. It was pretty cool and made the trip to the ruins worthwhile. I also found a Laundromat in Telum and put about half my belonging in to get washed. Clean clothes, yeah!! Missing Knickers, Booo!